Talks for Croatia to join the European Union will start next year. EU leaders at a two-day summit in Brussels announced Croatia's new status as an official candidate country. The European Commission's President Romano Prodi said: "We are very satisfied because Croatia is going with us into Europe." 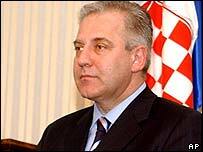 Croatia hopes to join the EU in 2007, together with Bulgaria and Romania. Ten countries joined the EU in May, taking the total to 25. EU leaders used the summit to reiterate that they want Romania and Bulgaria to join the union together in 2007. The Irish Prime Minister, Bertie Ahern, whose country holds the rotating presidency, said there were no plans to separate the two countries' entry, provided they both met membership criteria. Earlier this week Bulgaria completed negotiations on its accession, and correspondents say there has been speculation that it may join the EU before Romania, which is hoping to complete talks on its accession by the end of this year. Regarding Croatia, the 25 leaders agreed that it had met the criteria necessary to get the official status of applicant. In April, the EU's executive arm, the European Commission, said Croatia should get formal candidate status after its political and economic reforms were judged successful. It also praised its readiness to co-operate with the UN war crimes tribunal at The Hague - Prime Minister Ivo Sanader's conservative government has facilitated the surrender of eight war crimes suspects to the tribunal. The EU leaders reiterated that, to meet membership criteria, Croatia needed to maintain full co-operation with the tribunal, improve minority rights and speed up the return of ethnic Serb refugees who fled the country during the wars of the 1990s. Croatia would be the second former Yugoslav state to join the EU. Slovenia was among the 10 states who joined on 1 May. Bulgaria, Romania, and Turkey are already candidates for membership. Turkish Prime Minister Recep Tayyip Erdogan, who is attending the summit, has also said entry talks may begin for Turkey as early as March 2005. EU leaders are due to decide in December whether Turkey has made enough progress on human rights and political freedoms to begin the negotiations.